Push Button Influence is a comprehenssive training course that help you broadcast your business and secure more media exposure, hence gain higher engagement to and influence, and create high confidence branding. If you would like to become affiliate as well, I suggest you join the crowd here. What is Push Button Influence ? Push Button Influence is a comprehenssive training course by Alex Mandossian and Steve Olsher, which to be frank, on how to get exposure. What I am saying is that, it is a method that show you how to expose your business to others, and thus create a branding or build a name for your business. How is Push Button Influence relevant to you ? 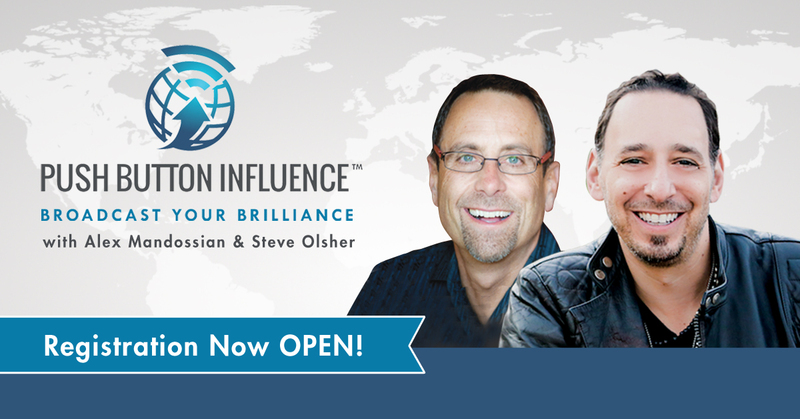 Push Button Influence consists of 5 modules – which they (Alex & Steve) called it the 5 pillars. The training course will help you to create your first web TV show/Radio in 21 days! Publish 3 shows on iTunes or Sticher or YouTube in 44 days! Get invited as a guest on an influencer’s show or have a media influencer on your show in 66 days! The PBI Method – 1st April – Join Now! How to Get On Influencer’s Show – 2nd April – Join Now! How to Create Your Own Show – 3rd April – Join Now! The Proven 3-steps Process – 5th April – Join Now! Your Bigger, Brighter & Bolder Future – 6th April – Join Now! Given the content provided from the course, it is highly action-driven. If your business to gain lots of exposure through media (superb visibility and traffic), it is a must-have course that you cannot miss. The step-by-step blueprint and the challenges thrown in are incredibily detail. If you follow the course thoroughly, you business will become a known brand in no time. I would give a thumbs up for the course, and I would recommend a buy. Seriously, this is business. By the way, check out the sales page. You will be surprised that there is a 29-year old Malaysian pharmacist gal who is able to engage health/nutrition media stars J.J Virgin and Dave Asprey using PBI method! She was able to launch a successful blog in Detox Diet niche!